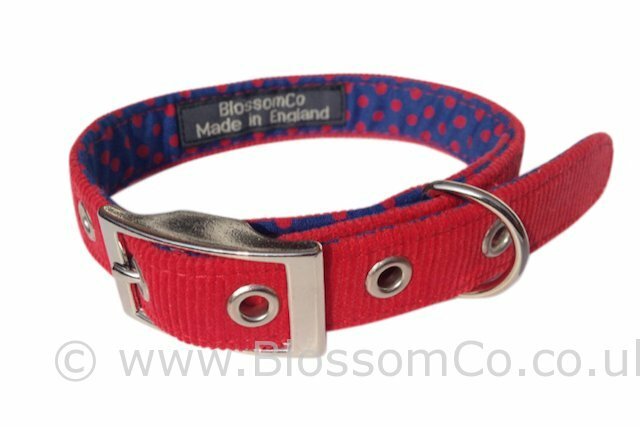 With exhibition season looming, what better opportunity could there be to introduce two new designs to the incredibly popular BlossomCo collection of Made in England, handmade dog collars and leads. ‘Otto’ is a tasteful combination of red cord with a red and navy spot lining. It is the perfect accoutrement for those looking to dress to impress. Our other new design, ‘Kitty’, is a beautiful blue floral with a red spot backing. It is guaranteed to make your dog the envy of the park! And it’s so new we haven’t managed to get it photographed properly yet! (You can see it for real though if you visit us at Pulse – details below). What better way to treat your dog than with a lovely new BlossomCo collar and lead? It is the perfect accessory. Don’t forget to come and see us and our new designs at Pulse, Earl’s Court from 11th-13th May, and at Harrogate Home and Gift from 13th-16th July.